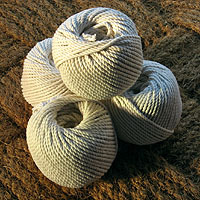 Cotton Seine Twine A good quality three strand twisted cotton seine twine by the ball. Medium hard lay. Various sizes. Marlin Spikes Steel marlinspikes by C.S. Osborne with flattened tips for working wire or heavy rope. Knife Lanyard Knife Lanyard - 18" lanyard with a small brass shackle and loop. Loop can be girth hitched to a belt loop and hold a knife, keys, etc. at a comfortable working distance. Knife not inluded.